The 10th-anniversary edition of the transmediale Marshall McLuhan lecture was delivered by Megan Boler, a professor in the Department of Social Justice Education at the University of Ontario. As a highly interdisciplinary scholar, Boler has focused on the social implications of technology, including the relations between media, democracy, and education. In her McLuhan lecture, Truth as Event: The Affective Politics of Belief, she talked about her latest research into how we entered the so-called “post-truth” era, in which “emotions matter more than facts in determining belief.” Boler asked how we arrived here and considered how media and spectatorship—particularly on social media—factor into constituting and producing the emotions that underlie belief and, in turn, constitute “truth.” What is the role of the artist, intellectual, and activist in this challenging political era? 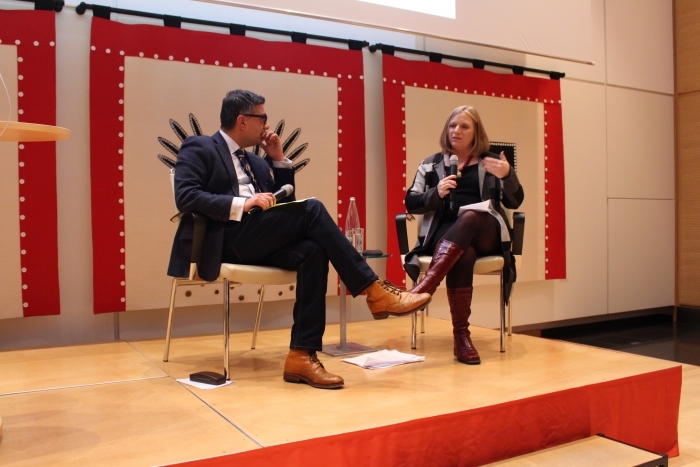 The talk provided an overview of the affective politics shaping our contemporary experience and concludes with the question as to how art and satire may function as public pedagogies to provide reality checks on the surreality of our times. The lecture was followed by a conversation with Faisal Devji, a historian whose work has dealt with ethics and violence in a globalized world.